Some of Europe's biggest energy and manufacturing firms say the EU must act to raise the price of carbon and ensure that CO2 emissions targets are met. A letter to the European Commission from the industry group warns that the future of the EU's Emissions Trading Scheme (ETS) is at stake. The EU Corporate Leaders Group on Climate Change (EUCLG) includes Royal Dutch Shell, Enel, Alstom and Acciona. 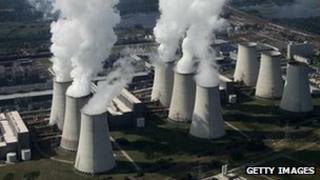 EU carbon permits have dropped 55% in price this year, to 6.45 euros (£5.40). ETS permits, each representing a tonne of carbon emissions, are traded to give industry a financial incentive to cut CO2 emissions and invest instead in green energy. The EUCLG's patron is Britain's Prince Charles. The group's letter called for permits to be withheld in Phase Three of the ETS, which begins in 2013. Reducing the supply of carbon permits would push up the price, they argue, saying "it is critical that the European institutions take decisive action now". The letter to EU Commission President Jose Manuel Barroso urged a "recalibration of Phase Three of the ETS by withholding allowances and designing a robust Phase Four that will send the right long-term price and investment signal and will immediately strengthen the carbon price". The EUCLG Director, Sandrine Dixson-Decleve, told BBC News that "the ETS is no longer functioning as it should be functioning". "We're in a financial crisis, and as we're trying to look at the eurozone we need to look at the existing [carbon] market and make sure it's functioning, so recalibrating the market to take into consideration the situation we're in." She said the financial crisis had helped to reduce Europe's CO2 emissions, because of the slump in industrial output. That makes it more likely that the EU will meet its target of a 20% emissions cut by 2020. "So the question is whether we need to tighten that target," she said, adding that some companies in the EUCLG were calling for a cut of 25% or even 30%. Currently the ETS, launched in 2005, sets pollution limits for more than 11,000 energy firms and carbon-intensive manufacturers. If an installation's CO2 emissions are higher than the number of permits it has, it must buy extra allowances from other installations which are lower CO2 emitters. The EUCLG wants the EU's Energy Efficiency Directive to be aligned with the ETS, because it expects a 13.9% reduction in carbon prices if firms in the ETS increase their energy efficiency.